There's nothing like savory starters to begin your night of glitz, glamour, and good memories. Tender, juicy Sliders are foolproof crowd-pleasers while Filet Mignon Bites offer a morsel of mouthwatering mild steak flavor no one can resist. The entertaining doesn't stop there! 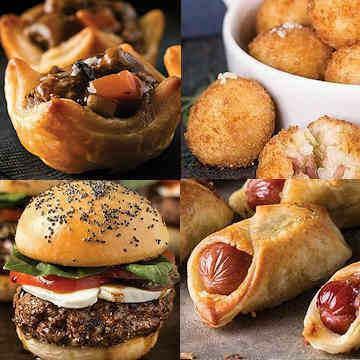 Intensely flavorful, crispy Arancini and scrumptiously seasoned Gourmet Franks in a Blanket are sure to satisfy well after the ball drops... Order this collection of gourmet, freezer-to-oven easy appetizers today! Thaw in Refrigerator. Grill or Broil: Grill or broil for 2-3 minutes per side or until internal temperature reads 160�F. Overcooking can result in a dry product. Contact Grill: Grill for a total of 3 minutes or until internal temperature reaches 160�F. Pan-Fry: Preheat a small amount of cooking oil in a nonstick pan over medium heat. Add burgers and pan fry for 2-3 minutes on each side or until internal temperature reaches 160�F. OVEN: Preheat the oven to 400�F. Remove film from tray. Place tray on a baking sheet. Bake 24 - 26 minutes on middle oven rack. Cool 5 minutes before serving. Oven: Preheat oven to 425�F. Remove desired number of frozen Arancini's from tray and place on a foil lined baking sheet allowing 1 inch or more between pieces. If necessary use two baking sheets. Bake uncovered for 15-16 minutes. OVEN: Preheat oven to 400�F. Remove desired number of dogs from package. Place on a foil-lined baking sheet allowing 1-2 inches between pieces. Bake 18 - 20 minutes. Let stand 2-3 minutes before serving. Product must reach an internal temperature of 165�F as measured with a food thermometer. Product must be cooked to an internal temperature of 165�F as measured by a food thermometer. Appliances vary; adjust cook time if excessive browning occurs. Oven: Preheat oven to 400�F. Remove desired number of crab cakes from packaging and place on a lightly oiled, parchment lined baking sheet with a minimum of 1 inch between pieces. If preparing the entire bag of crab cakes, increase oven cook time by 2 minutes on the second side. From Frozen: Cook for 12 minutes, carefully flip over using a spatula and cook for an additional 3 minutes. Remove from oven and serve. From Thawed: Cook for 9 minutes, carefully flip over using a spatula and cook for an additional 3 minutes. Remove from oven and serve. Stove Top: Place 1 teaspoon of oil and 6 or 7 crab cakes spaced a minimum of 1 inch apart in a cold, nonstick pan. Cover and cook on medium heat. From Frozen: Cook for 9-10 minutes on first side then carefully flip over using a spatula. Cook for an additional 2-3 minutes. Remove pan from heat, let rest covered for 2 minutes before serving. From Thawed: Cook for 7 minutes on first side then carefully flip over using a spatula. Cook for an additional 3 minutes. Remove pan from heat, let rest covered for 2 minutes before serving. Caution: While every attempt has been made to remove all shells, small pieces may still remain. Ingredients: Ground Beef. These products are processed in our plants in Nebraska, USA after undergoing a strict series of quality checks and under the supervision of the United States Department of Agriculture. Ingredients: CRAB MEAT (PORTUNUS SPP), MAYONNAISE (EXPELLER PRESSED CANOLA OIL, PASTEURIZED WHOLE EGGS, FILTERED WATER, HONEY, DISTILLED WHITE VINEGAR, SEA SALT, MUSTARD [DISTILLED VINEGAR, WATER, MUSTARD SEED, SALT], LEMON JUICE CONCENTRATE), BREAD CRUMB (UNBLEACHED WHEAT FLOUR, CANE SUGAR, YEAST, SEA SALT), PASTEURIZED EGGS (WHOLE EGGS, CITRIC ACID, AND 0.17% WATER ADDED AS A CARRIER FOR CITRIC ACID), ONION, MUSTARD, LEMON JUICE, SEASONING (CELERY SALT [SALT, CELERY SEED], SPICES, AND PAPRIKA), SUGAR, PARSLEY. CONTAINS: SHELLFISH (CRAB), EGGS, WHEAT.